OptionBit.com is advertised as “the premier option trading platform” with several unique features. This option trading platform is powered by TradoLogic, the same platform that powers other broker sites such as OptionXP. The selection of assets is rather limited compared to many other trading platforms, which may be limiting to investors who want a broad range of assets from which to choose. For beginners, though, the limited selection is probably adequate. OptionBit.com obtains its financial data from Reuters. Creating an account is simple. Note, though, that this website specifies that you must be at least 18 years old to sign up. 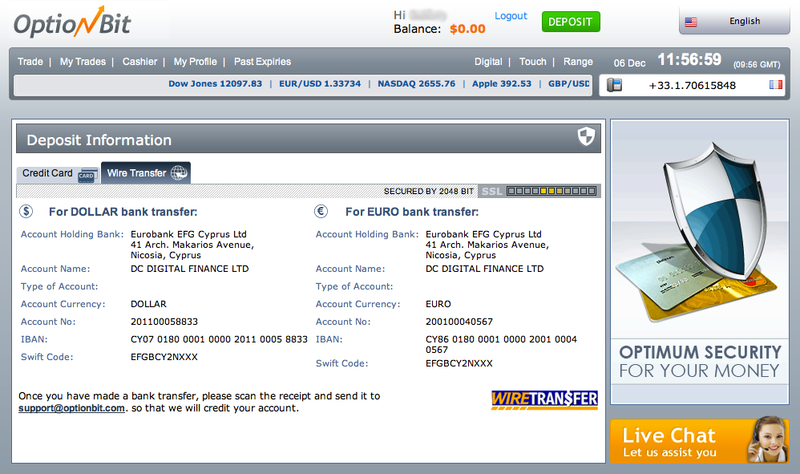 There is no registration fee and the minimum deposit to trade in a real money account is $100. This website accepts payment from Visa, MasterCard, Western Union, and wire transfers. One thing that stands out about the user interface on OptionBit.com is its organization. On the top, you have a scrolling ticker that updates you with spot prices of certain assets. You can easily switch between asset categories, and the control buttons for Call or Put binary options are easy to see and use. On the bottom are two important features. One is a list of all of your open contracts. Your maximum investment amount is $1,000, but you can get around that by having multiple contracts open at the same time. The second feature (discussed more below) is Trader Insight. 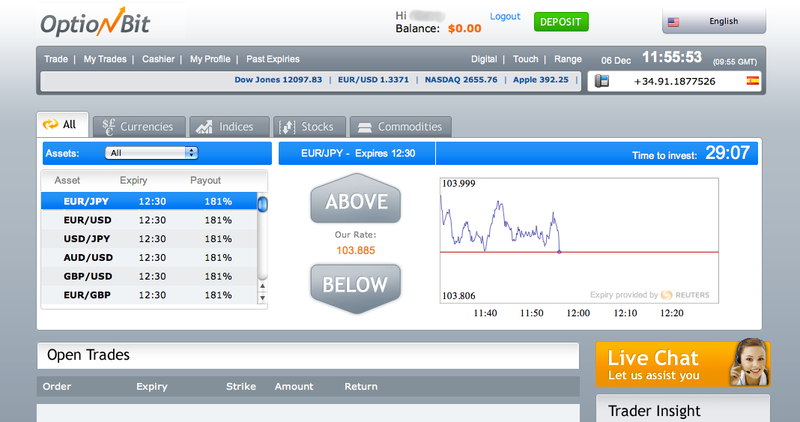 On a whole , the user interface is pretty simple to use and is adequate for most option traders. As mentioned above, Trader Insight is a unique feature that OptionBit.com offers. It gives you an at-a-glance summary of what other traders are doing in regards to select assets. While you shouldn’t base your decision solely on what other traders do, it can help you find the hot option contracts. OptionBit.com offers another unique feature – Range trading. You basically predict if an asset will expire within a predetermined range. For example, if EUR/USD is at 1.50, and the option is from 1.40-1.60, you predict that the currency pair will stay within that range. If it expires at 1.59, you receive 75-85% of your investment. OptionBit.com advertises a 65-81% payout, with no commission. There is also no refund for out-of-the-money trades, which is a significant disadvantage to many. Customer service is another area we wanted to review for OptionBit. As an options broker, OptionBit has a duty to help its customers as much as possible and give them quality information in a timely manner. That is exactly what we wanted to test, so we created a list of questions that many option traders would want to ask at some point and requested answers from an online chat representative through their live chat program. Availability is one issue, since they are only available through normal business hours (which are Monday-Friday during the open market). We were also disappointed somewhat in that they did not tell us much that we could not find ourselves by reading through the website. For example, they did not provide to us the specific fees for withdrawing via wire transfer or credit card. They also were not specific about which, if any, regulatory body oversees the company. They were, however, very courteous and polite, which is always a plus. At no point did we feel they were being rude or unreasonable. We would prefer more knowledge, but at the least, they were easy to work with – a must for many traders today. 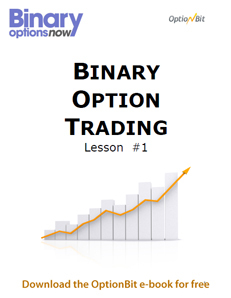 If you would like more information on OptionBit and the services they offer, click here to download a free ebook that explains how to trade binary options with OptionBit. OptionBit.com is worth a look for beginners who may not want a wide range of assets. The demo account with $500 in practice money and simple interface are both attractive, but more advanced traders may be turned off. Also, there is no American support line for help. It is worth a shot for the demo account alone, so beginners should give it a try.